^ Porter, Dennis (2003). "Chapter 6: The Private Eye". In Priestman, Martin. The Cambridge Companion to Crime Fiction. Cambridge: Cambridge University Press. pp. 96–97. ISBN 978-0-521-00871-6. ^ a b Collins, Max Allan (1994), "The Hard-Boiled Detective", in de Andrea, William L, Encyclopedia Mysteriosa, MacMillan, pp. 153–4, ISBN 978-0-02-861678-0 . A literary genre is a category of literary composition. Genres may be determined by technique, content. The distinctions between genres and categories are flexible and loosely defined, often with subgroups, the most general genres in literature are epic, tragedy and creative nonfiction. They can all be in the form of prose or poetry, additionally, a genre such as satire, allegory or pastoral might appear in any of the above, not only as a subgenre, but as a mixture of genres. Finally, they are defined by the cultural movement of the historical period in which they were composed. Genre should not be confused with age categories, by which literature may be classified as adult, young adult. They must not be confused with format, such as novel or picture book. Just as in painting, there are different types, the landscape, the still life and these types tend to share specific characteristics. Genres describe those works which share specific conventions, Genres are often divided into subgenres. Literature, is divided into the three forms of Ancient Greece, poetry and prose. Poetry may be subdivided into the genres of lyric, the lyric includes all the shorter forms of poetry, e. g. song, ballad, sonnet. Dramatic poetry might include comedy, tragedy and mixtures like tragicomedy, the standard division of drama into tragedy and comedy derives from Greek drama. This parsing into subgenres can continue, comedy has its own subgenres, for example, comedy of manners, sentimental comedy, burlesque comedy, and satirical comedy. Often, the used to divide up works into genres are not consistent, and may change constantly. Types of fiction genres are science fiction, historical fiction, realistic fiction, semi-fiction spans stories that include a substantial amount of non-fiction. It may be the retelling of a story with only the names changed. The other way around, semi-fiction may involve fictional events with a semi-fictional character, Genres may easily be confused with literary techniques, though only loosely defined, they are not the same, examples are parody, frame story, constrained writing, stream of consciousness. Mystery film is a genre of film that revolves around the solution of a problem or a crime. It focuses on the efforts of the detective, private investigator or amateur sleuth to solve the mysterious circumstances of an issue by means of clues, suspense is often maintained as an important plot element. This can be done through the use of the soundtrack, camera angles, heavy shadows, Alfred Hitchcock used all of these techniques, but would sometimes allow the audience in on a pending threat draw out the moment for dramatic effect. This genre has ranged from early mystery tales, fictional or literary detective stories, a related film subgenre is spy films. Mystery films mainly focus with solving a crime or a puzzle, the mystery generally revolves around a murder which must be solved by policemen, private detectives, or amateur sleuths. At times the viewer is presented with information not available to the main character, the central character usually explores the unsolved crime, unmasks the perpetrator, and puts an end to the effects of the villainy. The successful mystery film adheres to one of two types, known as Open and Closed. Mystery novels have proven to be a medium for translation into film. The sleuth often forms a leading character, and the plots can include elements of drama, character development, uncertainty. The locales of the tale are often of a mundane variety. Successful mystery writers can produce a series of books based on the same sleuth character, until at least the 1980s, women in mystery films have often served a dual role, providing a relationship with the detective and frequently playing the part of woman-in-peril. The women in films are often resourceful individuals, being self-reliant, determined. They can provide the triggers for the events follow, or serve as an element of suspense as helpless victims. The earliest mystery films reach back to the silent era, the first detective film is often cited as Sherlock Holmes Baffled, a very short Mutoscope reel created between 1900 and 1903 by Arthur Marvin. It is the film to feature the character of detective Sherlock Holmes. Alfred Damon Runyon was an American newspaperman and short story writer. He was best known for his short stories celebrating the world of Broadway in New York City that grew out of the Prohibition era, to New Yorkers of his generation, a Damon Runyon character evoked a distinctive social type from the Brooklyn or Midtown demi-monde. The adjective Runyonesque refers to type of character as well as to the type of situations. His distinctive vernacular style is known as Runyonese, a mixture of formal speech and colorful slang, almost always in present tense and he is credited with coining the phrase Hooray Henry, a term now used in British English to describe an upper-class, loud-mouthed, arrogant twit. Runyons fictional world is known to the general public through the musical Guys. 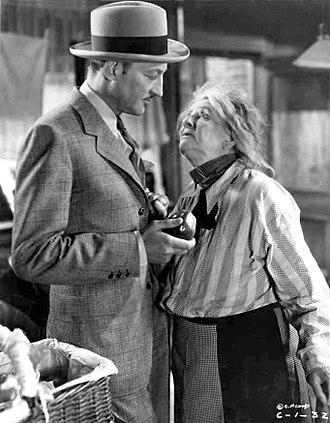 The musical additionally borrows characters and story elements from a few other Runyon stories, the film Little Miss Marker grew from his short story of the same name. Runyon was a newspaper reporter, covering sports and general news for decades for various publications. Damon Runyon was born Alfred Damon Runyan to Alfred Lee and Elizabeth Runyan and his relatives in his birthplace of Manhattan, Kansas included several newspapermen. His grandfather was a printer from New Jersey who had relocated to Manhattan, Kansas in 1855. In 1882 Runyons father was forced to sell his newspaper, the family eventually settled in Pueblo, Colorado in 1887, where Runyon spent the rest of his youth. By most accounts, he attended school only through the fourth grade and he began to work in the newspaper trade under his father in Pueblo. In present-day Pueblo, Runyon Field, the Damon Runyon Repertory Theater Company, in 1898, when still in his teens, Runyon enlisted in the U. S. Army to fight in the Spanish–American War. While in the service, he was assigned to write for the Manila Freedom, after his military service, he worked for various Colorado newspapers, beginning in Pueblo. His expertise was in covering the teams in Colorado, he even briefly managed a semi-pro team in Trinidad. Raymond Thornton Chandler was a British-American novelist and screenwriter. In 1932, at the age of forty-four, Chandler became a fiction writer after losing his job as an oil company executive during the Great Depression. His first short story, Blackmailers Dont Shoot, was published in 1933 in Black Mask and his first novel, The Big Sleep, was published in 1939. In addition to his stories, Chandler published seven novels during his lifetime. All but Playback have been made into motion pictures, some more than once, in the year before his death, he was elected president of the Mystery Writers of America. He died on March 26,1959, in La Jolla, Chandler had an immense stylistic influence on American popular literature. He is considered to be a founder of the school of detective fiction, along with Dashiell Hammett, James M. Cain. 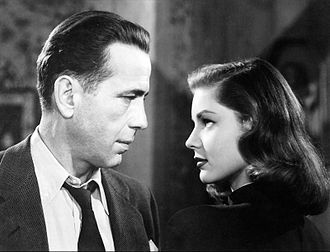 The protagonist of his novels, Philip Marlowe, like Hammetts Sam Spade, is considered by some to be synonymous with private detective, both were played in films by Humphrey Bogart, whom many consider to be the quintessential Marlowe. Some of Chandlers novels are considered important literary works, and three have been considered masterpieces, Farewell, My Lovely, The Little Sister, and The Long Goodbye, Chandler was born in 1888 in Chicago, the son of Florence Dart and Maurice Benjamin Chandler. He spent his years in Plattsmouth, living with his mother and father near his cousins and his aunt. Chandlers father, a civil engineer who worked for the railway. To obtain the best possible education for Ray, his mother, originally from Ireland, moved them to the area of Upper Norwood in the London Borough of Croydon, another uncle, a successful lawyer in Waterford, supported them while they lived with Chandlers maternal grandmother. Raymond was a first cousin to the actor Max Adrian, a member of the Royal Shakespeare Company. 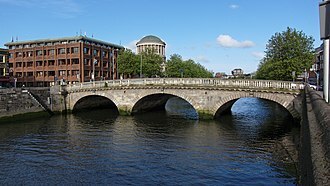 Chandler was classically educated at Dulwich College, London and he spent some of his childhood summers in Waterford with his mothers family. He did not go to university, instead spending time in Paris, in 1907, he was naturalized as a British subject in order to take the civil service examination, which he passed. Ross Macdonald is the main pseudonym that was used by the American-Canadian writer of crime fiction Kenneth Millar. He is best known for his series of hardboiled novels set in southern California, Millar was born in Los Gatos and raised in his parents native Kitchener, Canada, where he started college. When his father abandoned his family unexpectedly, Macdonald lived with his mother and various relatives, in Canada, he met and married Margaret Sturm in 1938. They had a daughter, who died in 1970 and he began his career writing stories for pulp magazines. Millar attended the University of Michigan, where he earned a Phi Beta Kappa key, while doing graduate study, he completed his first novel, The Dark Tunnel, in 1944. For his first four novels, he used his real name, after serving at sea as a naval communications officer from 1944 to 1946, Millar returned to Michigan, where he obtained his PhD degree. For his fifth novel, in 1949, he wrote under the name John Macdonald, in order to avoid confusion with his wife, Millar would use the pseudonym Ross Macdonald on all his fiction from the mid-fifties forward. 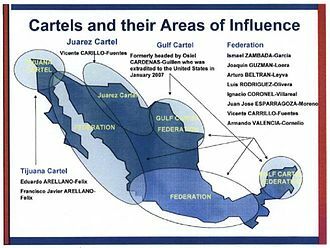 In the early 1950s, he returned to California, settling for some thirty years in Santa Barbara, in these the city is referred to under the fictional name of Santa Teresa. In 1983 Macdonald died of Alzheimers disease, Macdonald first introduced the tough but humane private eye Lew Archer in the 1946 short story Find the Woman A full-length novel, The Moving Target, followed in 1949. This novel would become the basis for the 1966 Paul Newman film Harper, Macdonald has been called the primary heir to Dashiell Hammett and Raymond Chandler as the master of American hardboiled mysteries. His writing built on the style of his predecessors by adding psychological depth. Author Tom Rizzo has pointed out that Macdonalds plots were complicated, lost or wayward sons and daughters were a theme common to many of the novels. Critics have commented favorably on Macdonalds deft combination of the two sides of the genre, the whodunit and the psychological thriller. Even his regular readers seldom saw a Macdonald denouement coming, inspired by F.
A femme fatale is a stock character of a mysterious and seductive woman whose charms ensnare her lovers, often leading them into compromising and deadly situations. She is an archetype of literature and art, in American early 20th century film, femme fatale characters were referred to as vamps, an allusion to their role as sexual vampires. The phrase is French for fatal woman, a femme fatale tries to achieve her hidden purpose by using feminine wiles such as beauty and sexual allure. In some situations, she uses lies or coercion rather than charm and she may make use of some subduing weapon such as sleeping gas, a modern analog of magical powers in older tales. She may be a victim, caught in a situation from which she cannot escape, a younger version of a femme fatale is called a fille fatale, or fatal girl. Femmes fatale are typically villainous, or at least morally ambiguous, and always associated with a sense of mystification, the femme fatale archetype exists in the culture and myth of many cultures. Ancient mythical or legendary examples include Mohini, the Sirens, historical examples from Classical times include Cleopatra and Messalina, as well as the Biblical figures Delilah and Salome. An example from Chinese literature and traditional history is Daji, the femme fatale was a common figure in the European Middle Ages, often portraying the dangers of unbridled female sexuality. The pre-medieval inherited Biblical figure of Eve offers an example, as does the wicked, along with them, there rose the gothic novel, The Monk featuring Matilda, a very powerful femme fatale. This led to her appearing in the work of Edgar Allan Poe, pre-Raphaelite painters frequently used the classic personifications of the femme fatale as a subject. Later, Salome was the subject of an opera by Strauss, and was popularized on stage, another enduring icon of glamour and moral turpitude is Margaretha Geertruida Zelle, 1876–1917. 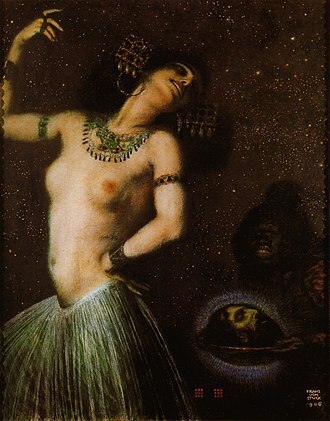 While working as a dancer, she took the stage name Mata Hari. 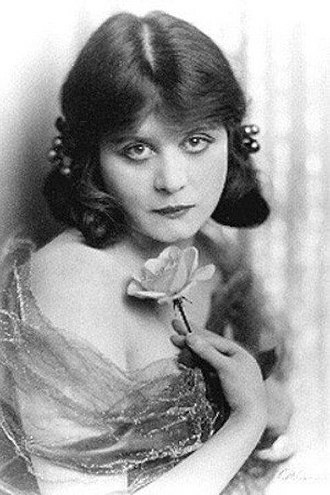 Although she may have been innocent, she was accused of German espionage and was put to death by a French firing squad, after her death she became the subject of many sensational films and books. Adventure was an American pulp magazine that was first published in November 1910 by the Ridgway company, an offshoot of the Butterick Publishing Company. Adventure went on to one of the most profitable and critically acclaimed of all the American pulp magazines. The magazines first editor was Trumbull White, he was succeeded in 1912 by Arthur Sullivant Hoffman, in its first decade, Adventure carried fiction from such notable writers as Rider Haggard, Rafael Sabatini, Baroness Orczy, Damon Runyon and William Hope Hodgson. Tuttle, Gordon MacCreagh, Henry S. Whitehead, Hugh Pendexter, Robert J. Pearsall, in 1912, Hoffman and his assistant, the novelist Sinclair Lewis created a popular identity card with a serial number for readers. If the bearer were killed, someone finding the card would notify the magazine who would in turn notify the next of kin of the hapless adventurer, the popularity of the card amongst travelers led to the formation of the Adventurers Club of New York. The original New York Adventurers Club led to clubs in Chicago, Los Angeles, Copenhagen. Hoffman was secretary of an organization named the Legion that had Theodore Roosevelt Jr. as one of its vice presidents, Hoffmans group would provide a model for the organisation of the American Legion after the war. Adventures letters page, The Camp-Fire featured Hoffmans editorials, background by the authors to their stories, at Hoffmans suggestion, a number of Camp-Fire Stations - locations where other readers of Adventure could meet up - were established. Robert Kenneth Jones notes that Adventure readers. often wrote in to report on meeting new friends through these stations, by 1924, there were Camp-Fire Stations established across the US and in several other countries, including Britain, Australia and Cuba. Adventure offered Camp-Fire buttons which readers wore, several of Adventures fiction writers wrote material for this column on their respective areas of expertise, including Gordon MacCreagh, Captain A. E. Dingle and George E. Holt. Lost Trails, which helped people locate missing relatives and friends, old Songs Men Have Sung, by Robert W.
Gordon, which was dedicated to discussing American folk-songs. 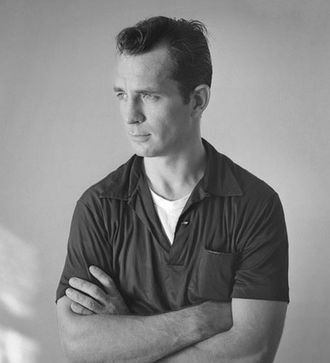 Gordon would run the Archive of American Folk Song at the Library of Congress, Hoffman encouraged the details of his writers fiction to be as factually accurate as possible-mistakes would frequently be pointed out and criticised by the magazines readers. In 1915 the publishers attempted to reach women readers with a new title, in addition, Adventure under Hoffman showcased the work of several famous artists, including Rockwell Kent, John R. Neill, Charles Livingston Bull, H. C. By 1924, Adventure was regarded, in the words of Richard Bleiler, after Hoffmans departure, his successors usually followed the template for the magazine that he had set down. In 1934, Adventure was bought by Popular Publications, throughout the 1930s, Adventure included fiction by Erle Stanley Gardner, Donald Barr Chidsey, Raymond S. Spears, Major Malcolm Wheeler-Nicholson, Luke Short, and Major George Fielding Eliot. Adventure continued to publish pieces by noted figures, including future film producer Val Lewton. John Dann MacDonald was an American writer of novels and short stories, known for his thrillers. MacDonald was an author of crime and suspense novels, many of them set in his adopted home of Florida. One of the most successful American novelists of his time, MacDonald sold an estimated 70 million books in his career. His best-known works include the popular and critically acclaimed Travis McGee series, and his novel The Executioners, during 1972, MacDonald was named a grandmaster of the Mystery Writers of America, and he won a 1980 U. S. National Book Award in the one-year category Mystery. Stephen King praised MacDonald as the entertainer of our age. Kingsley Amis said, MacDonald is by any standards a better writer than Saul Bellow, only MacDonald writes thrillers and Bellow is a human-heart chap, MacDonald was born in Sharon, where his father worked for the Savage Arms Corporation. The family relocated to Utica, New York, during 1926, during 1934, MacDonald was sent to Europe for several weeks, which began a desire for travel and for photography. After graduating from school, he enrolled at the Wharton School of the University of Pennsylvania. MacDonald worked at jobs in New York City for a brief time, was admitted to Syracuse University. They married during 1937, and he graduated from Syracuse University the next year, during 1939, MacDonald received an MBA from Harvard University. He was able to make use of his education in business. In 1940, MacDonald accepted a commission as a first lieutenant of the Army Ordnance Corps. During World War II, he served in the Office of Strategic Services in the China-Burma-India Theater of Operations and he was discharged in September 1945 as a lieutenant colonel. MacDonalds literary career began almost by accident, during 1945, while still in the Army, he wrote a short story and mailed it to his wife. She submitted it to the magazine Esquire, which rejected it and she sent it to Story magazine, which accepted for $25, good money for that time. He learned of this just after his arrived in the United States. The Maltese Falcon is a 1929 detective novel by Dashiell Hammett, originally serialized in the magazine Black Mask beginning with the September 1929 issue. The story has been adapted several times for the cinema, raymond Chandlers character Philip Marlowe, for instance, was strongly influenced by Hammetts Spade. Spade was a departure from Hammetts nameless detective, The Continental Op, the briefly seen character Rhea Gutman, who has no back story, does not appear in any of the film versions. In 1998, the Modern Library ranked The Maltese Falcon 56th on its list of the 100 best English-language novels of the 20th century. Note, the story is entirely in external third-person narrative, there is no description whatever of any characters internal thoughts or feelings, only what they say and do. In 1928, Samuel Sam Spade is a detective in San Francisco. A beautiful young woman, Miss Wonderly, hires them to follow Floyd Thursby, and find her sister and that night, Archer is found shot to death. A few hours later, Thursby is killed and Spade is a suspect, Spade refuses to tell the police about the client. The next morning, Spade coolly tells his secretary, Effie Perine. Miss Wonderly is soon revealed as adventuress Brigid OShaughnessy, involved with the title object, others are after the falcon, including Joel Cairo, an effeminate Greek homosexual, and Casper Gutman, a fat man accompanied by vicious young gunman Wilmer Cook. OShaughnessy begs for Spades protection, putting on a show of fear. They meet with Cairo at Spades apartment, while they are waiting, Spade tells OShaughnessy of the Flitcraft case, an odd story from his early years as a detective. After Cairo leaves, Spade again presses OShaughnessy, again she stalls, the next morning, she is asleep in his bed. While she is asleep, Spade slips out to search her apartment, Effie says OShaughnessy is all right and Spade should help her. Effie agrees to hide OShaughnessy at her home - but OShaughnessy disappears again instead, Spade meets Gutman in his hotel room, neither will tell what he knows. Spade implies he is looking out for himself, not OShaughnessy, the police suspect Spade in the shootings because he was bedding Archers wife Iva. Boyhood home of Damon Runyon in Manhattan, Kansas. Mickey Spillane, Ed Robbins and Joe Gill's From the Files of... Mike Hammer (January 31, 1954). 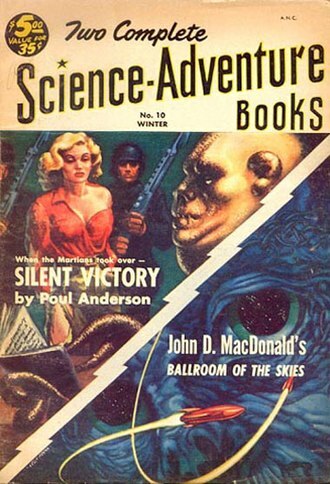 MacDonald's 1952 novel Ballroom of the Skies was reprinted in Two Complete Science-Adventure Books in 1953, but no paperback edition appeared until 1968.